A new smartphone app helps caregivers manage the myriad tasks of coordinating help for their loved ones with Alzheimer’s disease. A new smartphone app helps caregivers manage the myriad tasks of coordinating help for their loved ones with Alzheimer’s disease, the most common form of dementia, a disease that affects a person's memory, ability to think, to perform everyday activities, and their behavior. 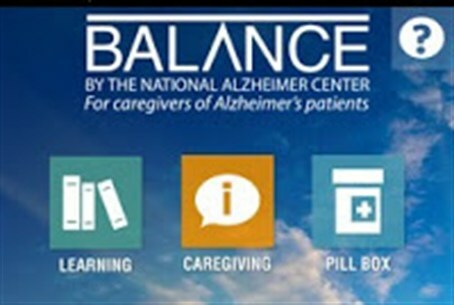 The app, called “Balance,” was developed by the National Alzheimer Center (NAC), a division of New York’s Hebrew Home at Riverdale (HHR) that was formed in 1986 to better understand, treat and advance care options for Alzheimer’s disease, and dementia in general. HHR is a non-profit geriatric service organization that cares for more than 10,000 seniors throughout the New York metropolitan area. The organization offers services through managed health care, community programs, home health care and its internationally recognized nursing home. “Balance” facilitates communication between multiple caregivers and helps track and share changes and other information in real-time with the Alzheimer’s patient’s doctor(s). “Caring for a loved one with Alzheimer’s is all about balance,” David V. Pomeraz, executive vice president of strategic planning and program development at HHR told the Alzheimer’s Weekly website. The app includes icons for Learning (sharing info about the disease), Caregiving (tips and info about the practical aspects of caregiving), Pill Box (to manage daily medications), Schedule (sharing calendars), Doctor Diary (tracking physical and emotional changes in the patient and sharing them with the doctor/s), News (reading the latest news about Alzheimer’s research, treatment and other developments, About (learning about NAC and HHR) and one for the NAC store as well, offering books, medical devices, vitamins and other Alzheimer’s products and services for sale. It is estimated that some 35.6 million people around the globe were living with dementia in 2010, according to the World Health Organization. Of those, 5.4 million people were affected in the United States alone, where Alzheimer's disease is the sixth leading cause of death.